Last Friday we had our first appointment at Perinatal Associates of New Mexico which is a group of physicians specializing in high risk pregnancies. No matter the type of twin pregnancy, all twin pregnancies are classified high risk. As such, we will continue to see the specialists throughout the pregnancy. The attention to detail during this doctor visit was impressive. The appointment took a little over three hours with one and half hours of that time spent with an ultrasound technician. The technician was very kind in providing us with a ton of photographs. Even cooler than the photographs was watching live video of the twins moving around. Both twins appeared to be doing back flips and full body twists. Of course all of this activity made it difficult for the technician to get the measurements she was after. The technician eventually persevered getting all necessary measurements and capturing photographs at the needed angles. Throughout the appointment the technician provided us with insight into what she was looking for. Frankly, it is amazing what trained professionals can determine from an ultrasound. Thankfully, all measurements and vitals point to a healthy pregnancy. Presently the twins are on-top of one another. 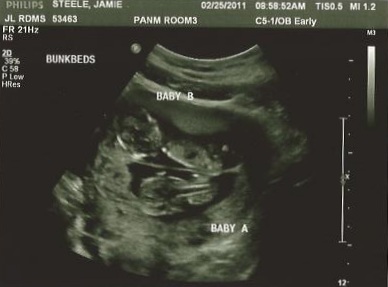 To us in this ultrasound photograph it looks like they are sleeping on a bunk bed. After meeting with the technician we had an appointment with the doctor. Our general OB/GYN had advised us that the specialist Obstetrician would provide a flood of statistics. This advice could not have been more correct. The statistics provided were a bit overwhelming, but boiled down to everything appears normal. The fact that stood out during the information deluge was there will be around 13 people in the room when Jamie delivers. Two obstetricians, a anesthesiologist, a nurse trained in anesthesiology, a pediatrician, and six nurses (three for each baby). The remaining two people will be Jamie and I. At this point Jamie is through her first trimester. She’s still battling morning (more like all day) sickness, but is looking forward to getting over it soon. We continue to be overjoyed at the prospect of having twins.